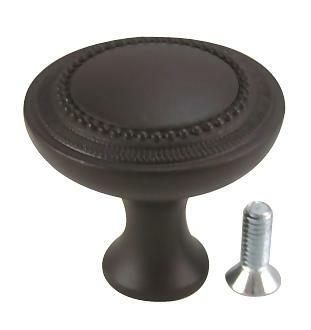 Kentwood Cabinet Knob (Oil Rubbed Bronze Finish): measures 1 1/14 inches in diameter with a projection of 1 1/4 inches. Comes complete with mounting hardware. Available finishes include Dull Satin Nickel, Gun Metal, Vintage Silver, German Bronze, and Oil Rubbed Bronze (shown).